The “rumours” have been confirmed! Unless improbable steps back happen, the Council of Ministers of April 13 did not approve the introduction of paragraph 2bis of Art. 38, paragraph 4, letter b, of the Code of Public Contracts, which would reward ISO 37001:2016 as a requirement for contracting authorities qualification (in Italy, the public contracting authorities need to be qualified by ANAC, the Italian Anti-Corruption National Agency). From the side of “defeated”, the “conspiracy theorists” will denounce that someone wanted to miss a good opportunity to introduce standardised rules in the management of the prevention of corruption and how someone wanted to avoid that certification bodies can “snoop” into procedures of public contracting. On the other side, the “winners”, the usual “certification skeptics”, are very happy because they believe that the ISO 37001 is only an opportunity to produce unnecessary paper and represents only a business for those who offer consulting, training and certification in the field. But can we really continue to think so??? The problem is that everyone, as usual, focuses on the exterior appearance of the ISO 37001 (certification) and not on its substance (prevention). We in the GIACC think as follows. 1) (regarding the qualification requirements of contracting authorities)… the positive evaluation of ANAC on the implementation of measures able to prevent the risks of corruption and to promote the the culture of law. This specific requirement, differently by criterion of quality and sustainability also established by the Code of Public Contracts, for the contracting authorities qualification, is properly part of the operational mission and professional skills of ANAC. But we are confident that the adoption of ISO 37001 by the contracting authorities, not only will not be ignored by ANAC in carrying their own duties, but ANAC will consider positively the implementation of a standard (in the specific sense of the word) as ISO 37001, that is internationally shared, as a good way to obtain the qualification requirement about the prevention of corruption by public contracting authorities. Simply, ANAC doesn’t want that ISO 37001 gives authomatic presumption of conformity, because this could “weaken” the role of ANAC. Let the same ANAC judges whether the implemented Anti-Corruption Management System (and not just on paper) by the contracting authorities according to the requirements of ISO 37001, is “really” and “effectively” implemented. To the “winners” we say to focus on “substance”. The ISO 37001 is an internationally shared standard that leads to achieve a corruption prevention model also for the public contracting authorities (and we know how much they would need it in certain areas): a really effective prevention model and above all, integrated with the other management systems already adopted formally and also referred in art. 38 of Code of Public Contracts, such as ISO 9001. And this may be a stimulus to avoid thinking about the fact that the adoption of an Anti-Corruption Management System is a further dead weight on their organisational efficiency but rather a completion of efforts and investments already implemented and a way to increase the ability to protect its stakeholders. Stop fighting a good idea just because somebody thinks only to obtain “awards”, “stars” and “pieces of paper”. There are so many organisations and many public contracting authorities which seriously intend to protect themselves, protect their stakeholders and invest also in prevention models of corruption and ISO 37001 will be an opportunity for them. And the fact that it constitutes a business, it is not wrong: anti-corruption, as all other areas of risk management, is already a business. In what is it different the ISO 37001? The same people that are against it because there are already laws and international conventions are also consultants paid by the organisations and public contracting authorities. 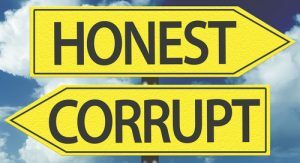 I conclude this post, calling once again to focus on what is really important:“to prevent corruption with Facts” (with a capital F) and not rushing to hoard certificates or awards, or viceversa doing unconstructive criticism. Let the organisations and contracting authorities choose the way to follow how to “do the Facts”. Let them choose, if they wish, the implementation of ISO 37001. And let the ANAC does his job by checking and evaluation. Let everyone plays its full role, in order to obtain a common goal: the progressive reduction of corruption, in favour of competitivity. I rumors sono stati confermati! A meno di passi indietro improbabili, il Consiglio dei Ministri del 13 Aprile u.s. nel licenziare il testo definitivo del Decreto Correttivo del Codice degli Appalti, non ha approvato l’introduzione del comma 2bis dell’Art. 38, comma 4, lettera b, che avrebbe previsto come requisito premiante ai fini della qualificazione delle stazioni appaltanti l’adozione di un Sistema di Gestione ISO 37001:2016. Da un lato gli “sconfitti”, i “complottisti” che denunceranno come si sia voluto perdere una buona occasione per introdurre delle regole standardizzate nella gestione della prevenzione della corruzione e come si sia voluto evitare che gli enti certificatori possano “ficcare il naso” nelle procedure delle stazioni appaltanti. Dall’altro lato i “vincitori”, i soliti “scettici delle certificazioni” che ritengono che l’ISO 37001 sia solo un’occasione per produrre carta inutile e rappresenti solo un business per chi offre consulenza, formazione e certificazione in materia. Ma possiamo veramente continuare a ragionare così??? Il problema è che tutti, come al solito, si concentrano sull’aspetto esteriore della ISO 37001 (la certificazione) e non sulla sua sostanza (la prevenzione). Concludo questo mio intervento, invitando nuovamente a concentrarsi su ciò che conta veramente, ovvero “prevenire la corruzione coi Fatti” (con la F maiuscola) e non correndo ad accaparrarsi certificati e bollini o esibendosi in critiche non costruttive. Lasciamo che le organizzazioni e le stazioni appaltanti scelgano la via da seguire per “fare i Fatti”, scegliendo se del caso delle regole standardizzate come la ISO 37001 e, se lo desiderano, sottoponendosi anche (ma non necessariamente) alla verifica di un ente indipendente di certificazione. E lasciamo fare all’ANAC il suo lavoro di verifica e valutazione. Ognuno svolga il suo ruolo, per l’ottenimento di un obiettivo comune. La progressiva riduzione della piaga della corruzione, a tutto vantaggio della competitività. Dividiamo la strada degli onesti da quella dei corrotti!! !